It's about time you devoted some time to the bathroom. When renovating and updating much of the home, it's easy to leave the bathroom for last. After all, tackling this small room with its mix of function and aesthetics is a design nightmare - unless you know the best tactics. Consider these to help you along to a better bathroom. First things first - bathrooms aren't known for their expansive storage. 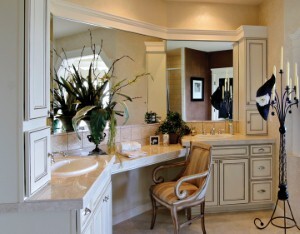 Take advantage of all the spare space you can by installing premier vanity cabinets. Then consider installing shelving above the toilet and in other corners where wall space goes unused. A better bathroom should be a greener bathroom, hands down. Sustainable living is a must in our world, and the bathroom is a great place to start or continue your crusade. Eco-friendly toilets and water-saving showerheads can be huge helps. You can also install LED bulbs to save energy and go green, but just as important is making sure your bathroom is always flush with light. It makes it easier to appreciate your design! Don't fear big windows or skylights - just keep them all high up!